Huge success for the M/Y “MR. OH”, one of the shipyard’s most recent models and the Grande Collection flagship. The 35 meters was awarded the highly coveted silver Nettuno, in the category ‘Semi-Displacement or Planing Two Deck Motor Yachts - 35m and Above’. The panel at the World Superyacht Awards 2018 has rewarded the perfect intuition shown by the designers of the Grande 35 Metri, which satisfies the modern owner’s needs by offering plenty of space for life on board, both outdoors and below deck. Unique in its category, “MR. OH” offers its guests not one but two beach clubs, with the 12 square meter beach area in the stern joined by a second 30 sqm lounge area or beach club in the bow, furnished with sun lounging sofas and a hydromassage tub. The sleek exteriors created by Stefano Righini act as counterpoint to the interior design by Achille Salvagni, who wanted the dynamism of the outdoor areas to be offset by calm, sophisticated settings below deck, featuring flowing layouts and elegant furnishings made even more special by one-off pieces created ad hoc. The Main Deck plays host not only to the big lounge, but also to the owner’s suite fitted with a private Instant Balcony, while the four VIP cabins are located on the Lower Deck. The focus on guests’ on-board comfort doesn’t stop at the big, light-filled spaces, but can also be seen in the care lavished on even the smallest details, right from the production and construction process. Innovative construction techniques have been used, for example, to reduce noise to a minimum, while the D2P_Displacement to Planning® hull delivers optimised navigation and even more efficiency. The winners were announced at a gala ceremony held on Saturday May 19 against the magnificent backdrop of Palazzo Vecchio in Florence. At the ceremony, Azimut|Benetti Group Vice President Giovanna Vitelli commented: “The prize awarded to the flagship in the shipyard’s most exclusive Collection confirms just how committed our team and all our collaborators are to offering only the best to Azimut owners in terms of comfort, design and technology”. Officine Panerai, Florentine brand of high sport watchmaking and Baglietto, historical world-leading shipyard in the construction of planing, displacement and semi-displacement yachts in steel and steel and aluminum from 35m to 70m, participate together with the fourth edition of Montenapoleone Yacht Club, which from 14 to 20 May 2018 will transform the Milan luxury street into an exclusive marina. A natural union between luxury and boating, as well as that between Officine Panerai and Baglietto. In addition to sharing the strong passion for the sea and Italian design, the two brands both boast a glorious past of epic adventures that are rooted in the history of the Navy. The Panerai watchmaking of Florence in fact created in the '30s the first underwater luminescent clocks for the raiders of the Italian Royal Navy, while in the same years the Cantieri Baglietto distinguished themselves for the construction of military boats, fast and performing, whose best known example it is that of the legendary MAS, the torpedo-armed motorboats, which Gabriele D'Annunzio renamed with the famous motto: Memento Audere Semper. Strengthened by a heroic past, but constantly projected into the future and technological innovation, Officine Panerai and Baglietto present exclusively, from May 14th 2018 at the Panerai boutique in Via Montenapoleone, a review of the most representative creations of Made in Italy excellence that distinguishes them. Throughout the duration of Montenapoleone Yacht Club, a striking installation Baglietto will welcome in the boutiques boating and high watchmaking enthusiasts who can admire the scale models of some of the most characteristic boats, built at the modern facilities of the La Spezia shipyard, such as the 46m Fast "Lucky Me" or the MV13 model inspired by Mas. Protagonists of the Panerai exhibition, the Submersible watches, solid, resistant and with an incomparable visibility up to 300 meters depth, like the Luminor Submersible 1950 Carbotech TM 3 Days Automatic , with case made of carbotech, a composite material based on carbon fiber or the Luminor Submersible 1950 Amagnetic 3 Days Automatic Titanium whose casing, with its innovative construction, prevents the formation of magnetic fields inside the watch. Around four weeks after the start of the insolvency application process, the situation at Bavaria Yachts (Bavaria Yachtbau GmbH) has been consolidated. Production has been stabilized and continuous deliveries have resumed: more than 30 yachts have left the shipyard in the last two weeks and have been handed over to customers. All 600 employees are engaged, agreements have been reached with all the key suppliers about further deliveries with short payment targets. Managers and administrators have started an investor process in order to reset Bavaria Yachts for the future. The objective is to be able to present an investor in July 2018. “We are continuing business and we intend to go into the coming order season with a new investor. We have already received initial expressions of interest and we are also actively talking to potential investors,” explains Dr. Tobias Brinkmann of Brinkmann and Partners, who has been called to the Board of Bavaria Yachts as a restructuring expert in the context of the self-administration process. Bavaria Yachts has given M&A consultants One Square Advisors a mandate to support the investor process. Beneteau is happy to announce Jean Francois Pape as the new Director of Communication. In his new role, Jean Francois will be at the head of Beneteau communication and marketing strategy, with a specific focus on the digital implementation. Jean-François holds fifteen years of experience in brand communication, with specific focus on digital strategy and CRM. He started in 2003 as project manager for marketing analysis within the group Usine Nouvelle, moving then to Havas group, where in 8 years he covered different roles from leading digital projects up to associated director. « I am extremely pleased to have Jean Francois joining our team » says Luca Brancaleon, General Manager of Beneteau, « he successfully accompanied several companies with their digital and marketing strategy, I am sure he will be a great asset for our company ». Before joining Beneteau, Jean Francois Pape led the digital team of the DDB agency in Nantes, with a focus on entertainment and aerial services. CRN wins the prestigious World Superyacht Awards 2018 with M/Y Constance 60m, receiving the Voyager’s Award for the most spectacular cruising itinerary created in 2017. Organized by the editorial group Boat International Media in the elegant Palazzo Vecchio in Florence, the event celebrates the excellence of the nautical world, involving owners and personalities of international yachting. This important acknowledgement once again pays tributes to CRN’s long-standing experience in the construction of state-of-the-art megayachts, characterized by innovative design and engineering solutions that make cruising a truly unforgettable and unparalleled experience. In early 2017, Constance’s Owner and his family cruised over 20,000 miles during a long and exciting cruise in the Caribbean Sea and the South Pacific. After sailing off Florida, Constance reached the Bahamas and Cuba, then continued towards the Cayman Islands, crossed the Panama Canal and finally reached Costa Rica. After cruising the pristine natural paradises of the Coco Islands and the Galapagos, the yacht headed towards French Polynesia, Cook Island and Tonga, Fiji, and then started its way back to Florida. Born from the successful collaboration between CRN and design firm Zuccon International Project, M/Y Constance 60m is a megayacht designed and conceived to maximize the pleasure of sailing and the constant contact with the sea, even during long-range cruising. M/Y Constance has proven to be capable of outstanding cruising performance, boasting a range exceeding 10,000 miles at 11 knots, which allows it to easily cross the ocean and return. The list of awards won by Custom Line Navetta 33 is now as infinitely long as the yacht is beautiful. After receiving the accolade as “Best Interior Design: Motor Yachts below 399GT” at the Boat International Design & Innovation Awards in January, it has now won a new international award as “Best Three-Deck Semi-Displacement Yacht”. This is a cause of great satisfaction, because the World Superyacht Awards are some of the most highly coveted in the international yacht world, celebrating a creative and innovative approach to both technology and design. The prestigious award, assigned by a panel of experts made up mostly of owners of important yachts and leading yacht world personalities, confirms that Custom Line Navetta 33 is a product of unparalleled excellence. The award ceremony, held last May 19 against the fabulous backdrop of the fifteenth century Palazzo Vecchio in Florence, assigned the prize to “Telli”, voted winner not only for its superstar appeal, but also for its peerless harmony of styles, shapes and sources of inspiration. A joint effort by the Product Strategy Committee led by Group Engineering Director Piero Ferrari, whose naval architects and designers created the interiors, and Studio Zuccon International Project, which designed the exteriors, this consummate work of yacht building artistry introduces some important technical novelties that join the innovative features already appreciated on previous Custom Line models. The Frauscher shipyard emerged victorious in a competition of the Austrian Federal Economic Chamber. In the category "over 10 employees", an eight-member jury chose the company's online presence as the "best homepage 2018". "This website has very attractive graphics, modern CI design and a clear structure and navigation. The website is intuitive and provides a good user experience," praised the jury, which determined the best online presence from a total of 119 submissions. Florian Helmberger and Susanne Schirl, responsible for marketing and sales, are pleased about the award: "The website is the digital business card of a company and many of our customers get a first impression here. Frauscher stands for tradition, innovation, quality and virtuoso design. Together with our longtime partner, the advertising agency Reichl & Partner, we have managed to make this philosophy visible online." The € 2,000 prize was awarded on May 16, 2018, as part of a celebration in the Sky Lounge of the Austrian Federal Economic Chamber. The Frauscher shipyard has decided to give the prize money directly to the Salzburg Cancer Research Institute at the University Hospital Salzburg. This donation is intended to support cancer research and thus the fight against cancer. Mike Matlack, owner of Gamefisherman, Inc. has recently announced the sale of his company to Erwin Gerards and Scott Dunnuck. Matlack has been at the helm of Gamefisherman since it was formed in 1985 and has built many legendary sport fishing boats; many of these boats are currently traveling the world over. Matlack is currently in the process of finishing a 50 foot Express and will remain with Gamefisherman to supervise and finish the project, and ensure a smooth transition. Gerards, who, among other high profile builders, has designed for Mike since 2008. Dunnuck, has owned, operated, and maintained many custom sport fishing boats. They are working on releasing a new line of composite Sport Fishing boats purposely designed and built for today’s demands. The Next Generation Gamefisherman’s are a perfect blend of sport with all the creature comforts. Simple, but functional with clean lines and ultimate performance. The new line of 43 foot models will be built of 100% advanced composite materials utilizing today’s construction techniques to reduce build time without sacrificing quality. The 43’ Nex Gen models will include a Walk-Around inboard or outboard, Express inboard or outboard, and Flybridge inboard with several interior layouts. In addition, Gamefisherman will continue to be available to build your ultimate custom model, in a variety of sizes. Gerards and Dunnuck are both very grateful to Matlack for this opportunity to keep his line of legendary sport fishing boats accessible for many years to come. Grand Banks is always seeking ways to better serve its new and existing clients of its Grand Banks, Palm Beach, and Eastbay series of yachts. The recent acquisition of Stuart Yard, in Stuart, Florida, is a significant step in that direction. At 12,000 square-feet, what will be called, Stuart Yacht Basin, home of Grand Banks Palm Beach and Eastbay yachts, includes covered storage, a fully operational service division, 50-ton TravelLift, and dock space. The yard will serve as the company’s US headquarters and will be managed Hank Compton, COO of Grand Banks America, who has been with the company for 14 years managing operations at the company’s factory. In addition, Hank managed sales and sales development in Australia and throughout the Asia Pacific region. “The acquisition of Stuart Yacht continues to follow our customer first philosophy that began with our factory direct sales model,” said Compton. “We’ll organize new boat commissioning out of the yard for our new Grand Banks, Palm Beach, and Eastbays, while also offering a complete array of yacht services for all of our owners and for all yachts. Gregg and Nancy Burdick have operated the yard since 1974, which also included a boatbuilding operation during one period. Grand Banks Yachts is excited to continue an association with the Burdicks and the yard’s current staff. “We looked at several possible properties. However, after developing so much respect for the business Gregg and Nancy built,” said Mark Richards, Grand Banks Yachts CEO and founder of Palm Beach Motor Yachts, “we knew this was the right decision. “The yard is surrounded by beautiful scenery, and it’s out of the congestion of other parts of South Florida. This creates a very natural fit for our culture and goals.” In addition to offering commissioning and maintenance services, the company will utilize the facility to showcase new product, and host private events. 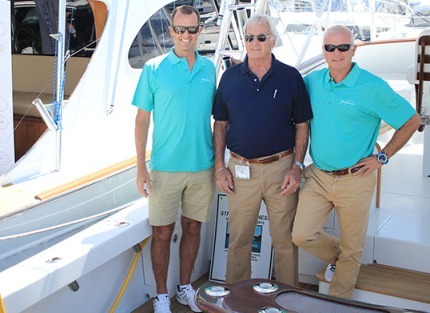 In fact, on March 16 more than 50 people attended the company’s first annual Yacht Hop where two new Grand Banks 60s were showcased, along with an Eastbay 44, Palm Beach 55s, Palm Beach 50, and select pre-owned listings. Plans are being developed for future enhancements and renovations and for a grand re-opening of Stuart Yacht Basin—the official home of Grand Banks, Eastbay and Palm Beach Motor Yachts. Grand Banks is hosting a very special Eastbay Rendezvous on June 9/10, 2018. Mystic Seaport Museum is the nation’s leading maritime museum with a 17-acre historic waterfront and an unrivaled collection of American maritime fine art, artifacts, and watercraft, including America’s oldest commercial vessel and sole remaining wooden whale-ship, the Charles W. Morgan, launched in 1841. With the opening of the award-winning Thompson Exhibition Building, Mystic Seaport Museum also embarked on a new Era of Exhibitions. Eastbay Rendezvous attendees will be able to enjoy two major Era of Exhibitions presentations The Vikings Begin, featuring rare Viking artifacts on-loan from Sweden’s Gustavianum Museum and The Vinland Map , on loan from Yale University’s Beineke Library. With support from Gowrie Group, a premier corporate partner of Mystic Seaport and the corporate sponsor for the Eastbay Rendezvous, participants in the Eastbay Rendezvous will receive admission to the Museum and exclusive behind-the-scenes tours of the Museum’s Collections Research Center where you will be able to explore some of the world’s finest collections of scrimshaw, nautical photography, maritime fine art and artifacts. In addition, attendees will enjoy a private cocktail party, courtesy of Grand Banks and Boatworks Yacht Sales and an afterhours exhibit viewing on Saturday evening, along with a complimentary breakfast,courtesy of Essex Yacht Sales, on Sunday, followed by a boat parade. Heesen is delighted to announce the appointment of BehneMar as its agent for the Middle East, which will represent the shipyard in United Arab Emirates, Kingdom of Bahrain, State of Kuwait, Sultanate of Oman, State of Qatar, Kingdom of Saudi Arabia, and Lebanese Republic. Following an increase in demand for superyachts in the region, Heesen has entered a partnership with the Gulf’s leading luxury yacht consultant with offices in Dubai and Riyadh. BehneMar will promote the Heesen brand among its distinguished and select group of clients, assisting the shipyard in planning, building and launching unique yachts that reflect the personality and lifestyle of their owners. The Heesen Board of Directors comments: “We are very enthusiastic about this new partnership in the Middle East and very much looking forward to working with the BehneMar team on exciting new projects. Beirut Boat 2018 is our first joint commercial effort in the region and our first step together on the path of a fruitful collaboration.” Hisham Abushakra – executive director of BehneMar – said: “BehneMar is looking forward to a fruitful cooperation with Heesen, as we notice an increasing demand of Middle Eastern based clients for Heesen’s iconic yachts in the 50 – 70m range”. South Carolina native, Captain Wil Thornhill guided the team fishing aboard the 77’ Jarrett Bay, Mama Who to victory at the 2018 Casa de Campo International Blue Marlin Classic tournament with a total of six blue marlins released during the three days of competition. “We were able to hold our lead till the end thanks to a great strategy, excellent crew and skilled anglers,” said a smiling Wil Thornhill. The team had finished tied for first at the end of day one with two blue marlin releases by angler Thomas Garmany. They took the lead on day two by adding three more blues to their score and released their sixth blue on day three to win despite a strong challenge from the Brazil-Venezuela team aboard Florida based Business Stinks who released their fifth blue an hour before lines out on the last day for a second place finish. The third-place boat was Builders Choice, a Jarrett Bay 64′custom sportfish with a tournament total of four blue marlin releases. The three top boats were awarded a small fortune in cash and sponsor luxury prizes. In addition, the tournament’s Top Angler was Mama Who’s Thomas Garmany who released five of the boat’s six blues during the tournament winning the Mustad’s Silver Hook Trophy along with several nice sponsor prizes. “Thomas was focused at all times and in rough seas showed off his patience, experience and angling skills” added an elated boat owner, team member and lady angler Lainey Jones. He was followed by Builders Choice, Eli Blake, with three blue marlin releases and Business Stinks, Lucas Abud, also with three blues but his last release was after Eli’s so the tie was broken by time of the last release. Top lady angler was Kary Gomez, member of the all-girl team aboard Amazing Grace edging out the other six ladies who competed in the event. Luxury motor yacht manufacturer, Maritimo, has had its most successful boat show in a decade at this weekend's Sanctuary Cove International Boat Show with sales in excess of its all time record of $37 million prior to the GFC. The sales rush in the past four days puts Maritimo ahead of the $37 million record on the last day of the show and that figure is set to increase further as deals are finalised over coming days. Maritimo CEO Garth Corbitt said sales had been made across the entire range of the company's models with the X60 luxury sports yacht and the S70 and M70 motor yachts attracting big interest. There were multiple X60 sales following its world premiere on Thursday. "We have dealer partners here from New Zealand, Monaco, Thailand, China and the USA as well as from throughout Australia and the atmosphere is simply electric," he said. "The world premiere of the X60 sports yacht has drawn huge attention to Maritimo and sales have just flowed throughout the whole show. "We have numerous factory tours planned for the coming week with prospective buyers and I'm confident that our total sales from the show will move even further ahead". Corbitt said the result was good news for the Gold Coast economy overall with hundreds of jobs now further supported by forward orders. Maritimo's forward order book now stretches out to the end of 2019. "To say we are thrilled is somewhat of an understatement and the result vindicates all the hard work, planning and innovation that we have undertaken to make out product world class," he said. There is ever more plastic waste floating in our seas, damaging the health and beauty of the marine environment. As a yacht builder, Moonen feels a special affinity for the oceans and is joining forces with the Plastic Soup Foundation to help keep the seas clean for future generations. The term ‘plastic soup’ was coined by oceanographer and racing boat captain Charles J. Moore to describe the giant mass of waste and particles found floating in the Pacific Ocean in the 1980s. Today it refers to plastic pollution of the oceans in general, and the goal of the Plastic Soup Foundation is to prevent more plastic from ending up in the world’s seas. Moonen knows that a good time on the water depends on your yacht, your company and the surrounding marine environment. Sailing through plastic debris and lifeless seas is nobody’s idea of fun, and there are also strong economic and moral arguments for keeping the oceans clean. In this sense, Moonen’s ‘Fun on the Water’ motto is intimately linked with that of the Plastic Soup Foundation, ‘No Plastic Waste in our Water’. Moonen’s partnership with the Plastic Soup Foundation will help ensure that good intentions are translated into real actions. We are also doing our part to raise awareness of the plastic soup issue via various campaigns, and yard employees will be taking part in and or sponsoring running events, triathlons, bike races and regattas. The first such event will be the 10-kilometre Vestingloop planned in Den Bosch on 27 May. Moonen Shipyards in the Netherlands has completed the five-month refit project of the 29-metre fast displacement superyacht Ciao. Launched in 2007 as Nilo, the owners of this renowned Moonen expressly chose to have her return to Holland from her home in the Mediterranean for a new stabilization system, propulsion upgrades and various aesthetic upgrades. The end of April saw Ciao being put through her paces off the coast of the Netherlands to ensure that the new CMC zero-speed stabilizers were performing at their best. This electrical system worked very well both when sailing in choppy waves and at anchor. The expert engineers at Moonen had also spent the past months carrying out extensive maintenance and service on Ciao’s propulsion drive and Servogear controllable pitch propeller system. The sea trials confirmed that the yacht had certainly not lost any of her power, on the contrary, she reached an excellent top speed of 23.7 knots on the very first day. The all-new R35 from Princess is unlike anything that has come before, and is a seismic shift away from what the luxury yacht industry is used to seeing. A full carbon fibre hull houses two modern V8 petrol engines that deliver exceptional performance. On top of that, Princess has worked with America's Cup racing legends BAR Technologies to implement advanced foil technology, which powers the yacht to 50 knots. Designed in collaboration with acclaimed styling house Pininfarina, marrying substance with unmatched style, the R35 is about to re-write the rule book for motor yachts, as will the way it is being launched by the Plymouth-based luxury yacht manufacturer. Over the past few weeks Princess revealed a first of its kind TV campaign for this ground-breaking new yacht. The month long campaign is currently on air and was inspired by Japanese Anime and Manga style illustrations, which is a style that has never before been used by a luxury yacht brand. This unique campaign teases the top secret new yacht - which is still in development and prototype testing - that is due to be launched in September this year. The unpredictable TVC creative brings the R35 to life in a unique way, in stark contrast to anything previously produced by Princess. The wider media campaign comprises vibrant Manga inspired print ads, the 30 second Anime TV ad and a 90 second version of the Anime video which conveys the whole story - a mystical encounter, a game of cat and mouse, and an exhilarating sprint across the water - utilising a strong female lead character in a very sophisticated anime style. The TV commercial first aired across Sky via AdSmart over the Easter weekend, allowing Princess to target bespoke viewer profiles  The World Class Wealth and Premium fortunes, reaching the top 1% of homes in the UK. The original story behind the video was the brainchild of Princess' Marketing department and was brought to life via a partnership between Craft Films and renowned animation studio 'Breakfast of Champions'. Together they developed a series of unique characters and animated them into a comprehensive film. As well as the bespoke visuals, Princess commissioned an original soundtrack called "Refoolution", written and recorded by the celebrated Australian act 'Gando and Dr K.' Speaking on the inspiration for the video, Kiran Haslam, Princess' Marketing Director said, "Anime is a true-to-life yet still symbolic representation of reality. The use of it in our campaign means we can showcase the feel of the R35 without giving away the final look of the boat. Brands usually use simplistic illustration to create a whimsical feel. We wanted to use traditional Japanese techniques and compositions to create something more cutting edge, inspired by the great Anime films including Akira, Ghost in The Shell and Afro Samurai, and with details and depth more commonly found in Studio Ghibli style films, to show how exhilarating the new R class will be." The unique video campaign builds intrigue just before Princess releases more content on the R Class, and goes into detail on the revolutionary yachts Active Foil System and stunning design. This September the boat will be revealed at the Cannes Yachting Festival, and up until that point Princess has placed distinctive Manga-style movie poster print adverts across publications traditionally not explored by the marine industry, including Rolling Stone, RAMP, National Geographic, Wired UK and Wallpaper*. Seamlessly blending top end luxury with progressive performance technology, the R35 is a whole new breed of yacht, and is ready to disrupt the industry. Just like its media campaign, the R35 is revolutionary, reflecting Princess' extraordinary 53-year journey of UK manufacturing in its finest form. Sanlorenzo, a true excellence of the nautical world, has won this important recognition in the year of its 60 anniversary, thanks to a winning strategy that has allowed it to experience significant growth over the last decade, climbing the international rankings and positioning itself at the top in the production of yachts over 24 meters. The role of Massimo Perotti, Chairman and CEO of Sanlorenzo since 2005, has been fundamental, since he has been guided the company over the years with passion, determination and entrepreneurial vision, enhancing the brand's know-how and craftsmanship tradition and introducing important innovations that have allowed Sanlorenzo to stand out by profoundly changing the yachting industry. Andrea Restelli, Deloitte partner in charge of Best Managed Companies for Italy declares - "The response we had in this first edition was surprising and allowed us to detect the existence of real excellence on the whole national territory: different sizes and sectors, located in all Italian regions, which proved to be solid not only in terms of performance, but also for the ability to structure long-term strategies and for innovation and internationalization skills and the interpretation of an active role in the ecosystem in which they operate. Italian entrepreneurship is proving once again capable of generating value in traditional sectors and in the most innovative contexts, in which BMC companies are undisputed protagonists ". Born in Canada in 1993, the award has gained global recognition, becoming a prestigious award assigned according to the analysis of some critical success factors. The initiative promoted by Deloitte and also supported by ALTIS Catholic University, by ELITE - the London Stock Exchange Group project that supports the development and growth of high-potential companies - and by Confindustria, ended today with the award ceremony of the 31 winners that took place this the morning at Palazzo Mezzanotte in Piazza degli Affari in Milan. With a turnover of 300 million euros and over 900 yachts built in the course of its history, Sanlorenzo confirms its positive trend by investing, for the next 2 years, 60 million euros allocated to the research and development, for the construction of new products and the expansion and renovation of production facilities. One of the main shipyards worldwide producing yachts and superyachts, Sanlorenzo confirms itsrelation with the world of art by partnering with Art Basel in Basel 2018, the leading art fair for modern and contemporary art. An actual excellence in the world of boating, over the years Sanlorenzo has emerged thanks to its innovative approach, overcoming conventions and taking unexplored pathways: with dedication, courage and an entrepreneurial attitude Massimo Perotti, Chairmain and CEO of Sanlorenzo, has led the company to open itself to different realities which, however, speak similar languages like art and design, so to suggest a different way to experience sea life, leaving crystallised habits behind. On a consistent, transversal pathway which has brought it closer and closer to the world of art, during the year of its 60th anniversary Sanlorenzo has chosen the Art Basel show in Basel to tell the international audience about itself through the impressive installation set up at the Collectors Lounge, signed by Piero Lissoni, the company’s new art director, who pays tribute to Emilio Isgrò, one of the best-known contemporary Italian artists. An ethereal, suspended space whose perimeter is marked by Isgrò’s “erasures” reproduced on its walls. A sea made up of lines, signs, words through which the models of Sanlorenzo’s superyachts, displayed inside glass cases, seem to sail around the work “I viaggi della mente” (“The travels of the mind”) by Emilio Isgrò, which is exhibited at the centre of the installation. “Ulysses, the Greek hero from the Odyssey, is an explorer who sets out to discover the world with his own boat and his crew, as well as a traveller who longs for knowledge. His desire to learn and understand leads him to unknown destinations. Emilio Isgrò’s Odyssey also recounts a discovery, the revelation of a hidden meaning behind the words erased by the poem. The artist takes a cultural journey, a pathway capable of lighting up by contrasts and to bring new light, new meanings to Homer’s verses. Because each traveller is a contemporary Ulysses who reflects on the world and wants to discover it. Likewise, each journey is a discovery of places, people, cultures: a wonderful journey which begins from one’s mind and continues at sea.” I viaggi della mente - Omaggio a Emilio Isgró (The travels of the mind – A tribute to Emilio Isgró”). Piero Lissoni describes the natural connection between Sanlorenzo and art, honouring Emilio isgrò inside a wunderkammer, created with an iperminimalistic approach which is typical of Lissoni’s style, highlighting the company’s experience, artisanship and innovation, embodied by different superyacht models. Yesterday, the halls of Palazzo Vecchio in Florence have been the elegant setting for the World Superyacht Awards annual award ceremony, that this year saw the triumph of the 52Steel Seven Sins by Sanlorenzo, a shipyard of excellence in the world production of yachts and superyachts, in the Displacement Motor Yacht below 500GT category. Inaugurating an innovative model of nautical design, Sanlorenzo has received numerous important awards over the years, winning at the WSA again for the third consecutive edition. Organized since 2005 by the British editorial group Boat International Media and assigned by a jury of designers, engineers and experts from the nautical world, the World Superyacht Awards are among the most coveted awards in the sector and a prestigious recognition of creativity and innovation of the world’s finest luxury yachts. Sixteen Steelers from all over Europe came together in Urk last weekend for the 3rd edition of the Steeler Owners Weekend. The participants represented an amazing one third of the fifty motoryachts Steeler Yachts has built since 2010. The harbour of Urk was dominated by the Steeler fleet with all of the Steeler models present, including the brand new 59 S line ‘Ocean Camp’. During the Captains Dinner on Friday evening, the Steeler crew was surprised by the owners of 65S ‘Li-Janne’ with a beautiful hand made sculpture representing the unique experience of building the fully wheel chair accessible motoryacht for their family. An emotional moment for Steeler and all 52 guests present. On Saturday the fleet took of for Enkhuizen where a Shanti choir, a fish sandwich and a locally brewed beer welcomed the Captain’s at the Locks on their way to Volendam. The dinner in Volendam and the brunch on Sunday morning completed this fantastic event. The new 59 S ‘Ocean Camp’ left first, heading for Oslo. Most other owners decided to extend the ‘Weekend’ for one or a few more days enjoying the company of fellow Steeler owners. The Viking Family lost brother Steve Boerema this past weekend. Steve had been battling pancreatic cancer since the fall of 2017. His wife Suzy, daughter Marley and son Finley were the backbone of Steve's fight. His family meant everything to him and provided unwavering support and love. Steve joined the Viking Family in 2005 and successfully maintained and grew our international market. Through our dealer network and his many contacts, he traveled the world building our global family. Steve was respected by everyone in the industry as well as his many customers, now his friends, who he kept in touch with long after the business was complete. Steve passion for life and positive presence was felt by everyone he interacted with. A question, a story, a conversation and usually a "selfie" would immediately make anyone feel like his lifelong personal friend. His follow up phone call, text or random photo reminded you that Steve was thinking of you at that moment. Congratulations to Viking Yacht Company's exclusive interior designer, WBC Design, on their recent win at the Philadelphia Interior Design Awards. The team of John Kelly, ASID and Casey Smith claimed the prestigious 1st Place in Model/Show Home for their luxurious interior design of the Viking 93 Motor Yacht. Viking President and CEO Patrick Healey along with his wife Leanne were on hand to cheer on WBC at the Awards Gala held in Philadelphia. The Philadelphia Interior Design Awards is a biennial awards competition and gala hosted by the Pennsylvania East Chapter of the ASID. Above is the Co-Chair of the ISD Committee and Competition Christine DeHart with John Kelly, center, and Casey Smith. The Viking Yachting Center was proud to be a stop on the 2018 Police Unity Tour. The tour raises awareness of officers who have died in the line of duty and funds the National Law Enforcement Officers Memorial and Museum. This year's tour included nine chapters with over 2,200 participants. It began in North Jersey and concluded in Washington, DC. A grand slam earned the crew on the Viking 80 a second place finish at last week's fifth Annual Baker's Bay Invitational. Viking joined forces with Galati Yacht Sales and HMY Yacht Sales to fish the event in the Bahamas. Shown above is HMY's Rob Spano, Viking's Steve Ehrbar and Galati's Carmine Galati, Sr. The 18th Annual Mike Schmidt's Winner's Circle Invitational Tournament is a wrap! Two tournament records were smashed at this year's event and both aboard the Viking 70 Mr. LTD. Tom Beckmeyer's Viking boated both a 99-pound wahoo and a 115-pound tuna (above), both new tournament records. The team added a dolphin to the box to win the event with 237.6 overall pounds. Team Hulett fishing on the Viking 80 took 2nd Place Dolphin with a 52.2-pound fish (above), while Lynne Henderson (below) on her Viking 60 Fragrant Harbor claimed the largest dolphin in the ladies division with a 37.8-pounder. Debi Cantor fishing on Waterfront, a Viking 61, had the top tuna for the ladies at 15.4 pounds. Krazy Salt's, Dave Anderson's Viking 70, was the top billfish release boat with two blue marlin and two sailfish. In 2nd Place was Team Schumacher on the Viking 52 Miss Annie. Third place, based on time, went to the Viking 64 Stihl Leader with a blue, white and sail all released on the final day for a slam. "I've been fishing this event since it started almost 20 years ago, and as a committee member for 18 years it's exciting to see what a positive impact we have been able to provide these worthy charities," Stihl Leader Captain Brain Weaver says. "It's awesome to be a part of this comradery." Held at Old Bahama Bay on Grand Bahama Island, 100% of the profits from this event go to charity. More than $2 million has been raised and donated to the Cystic Fibrosis Association, American Cancer Society and Cleveland Clinic to name a few. Congrats to the Viking 72 Blue Bird! Don Jesus Montano's Blue Bird released one blue marlin, five white marlin and a sailfish to claim 2nd Place in the 12th Annual Cap Cana White Marlin Classic in Punta Cana, Dominican Republic, this past weekend. Look for this crew with Captain Miguel Tirado at the helm at the upcoming Caribbean Billfish Tournament later this month.